Central to Cabo & San Jose! 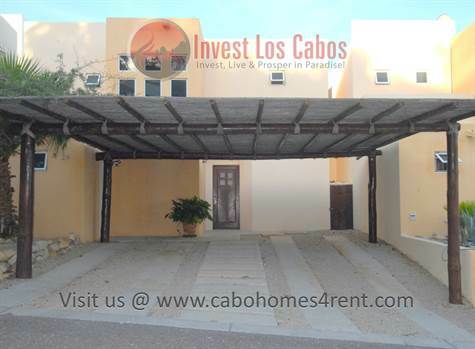 Lomas del Tule, El Tule - Centrally located between Cabo San Lucas & San Jose del Cabo is the tranquil and quiet residential community of Lomas del Tule (also known as Los Tules Residencial). Perched high on a hill overlooking the Sea of Cortes, this development offers its residents peaceful mid-corridor living, fresh ocean breezes, 24hr security and common areas which include a pool, children's area and BBQ/picnic area. This 3 bedroom, 2.5 bathroom home is offered semi-furnished (no furnishings in 2 bedrooms) and is perfect for a family or professional couple. The home's warm kitchen comes complete with stainless steel appliances and marble tiled countertops, backsplash & breakfast bar. The open floorplan living area opens up to a lushly landscaped private yard with a covered patio that is perfect for entertaining or even just a quiet candlelit dinner! Other features include: outdoor kitchen w/ charcoal grill, washer/dryer, and a wonderful private oceanview terrace off the master! Find yourself: 3mins to Chileno Bay Beach, 8mins to Cabo San Lucas, 12mins to San Jose del Cabo, 18mins to SJD International Airport and within 15mins of 5 world class golf courses! Available immediately on a 12 month contract. 1 month damage deposit due upon signing, 1st months rent & pagare (promissory note) for last months rent due upon occupancy. Pets okay with owner approval. Taxes & HOA included in rent, tenant responsible for all other utilities.